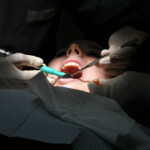 Planning for your major oral surgery in Mexico? No one looks forward to oral surgery. But you can make it as convenient as possible. At the least, you can avoid surprises and minimize risks by being prepared. The last thing you want is your dental surgery postponed – even worse, complications to arise while you are abroad. Each month, we help dozens of Americans and Canadians travel to Mexico for oral surgery. We are confident that if you follow your doctor’s advice, you will be in good hands at any of Dayo Dental’s partner dentists. Avoid hassles. Before you go to Mexico, learn how to prepare for oral surgery below. (Note: These are non-comprehensive and pre-surgery general guidelines. They are not meant to replace the specific instructions provided by your oral surgeon in Mexico). Dental implants are the most common oral surgery procedures in Mexico. This x-ray is taken from an actual Dayo Dental client. Inform your dentist in Mexico that you are taking blood thinners. Blood thinners can complicate oral surgeries. It’s takes longer to stop bleeding because the blood does not clot normally. Blood thinners include Coumadin, Aspirin, or Plavix. Typically, your dentist in Mexico will ask you to stop taking these blood thinners 3-5 days before the surgery. Consult your local doctor if it’s ok to temporarily stop blood thinners in preparation for dental surgery. If you have sensitive or major health risks, such as a recent heart surgery or diabetes, it’s best to get a written medical clearance from your local doctor before going to Mexico for major oral surgery. Who is the dentist that will be doing the surgery? Does he have the proper training for major oral surgery? How many years of experience does he have? Does he speak English? Do your online research about the dentist in Mexico, so you don’t end up with an inexperienced or unqualified dental surgeon. Consider bringing a companion if you are getting major oral surgery in Mexico. Patients who need major oral surgeries – such as full mouth extractions and multiple dental implant surgery – may opt for IV Sedation or General Anesthesia. The requirements for general anesthesia or IV sedation for oral surgery are stricter than local anesthesia. Bring an adult companion for safety and convenience. If you are driving to a Mexico border dentist – such as Los Algodones, Tijuana, Nogales or Juarez – your companion can drive you safely back to your home. If you can’t bring a companion, inform the dental office so that they can make special arrangements before your major dental surgery. In order to avoid complications, provide your full medical history during the pre-surgery consultation. Disclose all diseases, especially systemic diseases. Unfortunately, uncontrolled systemic diseases such as diabetes, hypertension and heart conditions may cause cancellation of your surgery. Disclose all your current medications, including over the counter meds. According to Dr. Jorge Carrasco, a Dayo Dental partner dentist in Cancun, Mexico, “Ask every big and small question, so you can be confident and relaxed during your day of surgery.” Actually, bring a list of questions. You want to be comfortable with your dentist. 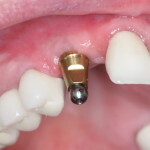 If you are getting dental implant surgery, understand the number of follow up visits required. Get a written copy of the cost of your oral surgery in Mexico. 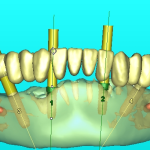 Ensure that you understand the pre- and post-surgery instructions from the dental clinic. If you overlook a critical instruction related to General Anesthesia or IV sedation for oral surgery, the dentist might postpone your surgery. Typically, your dentist will provide a set of written instructions on how to prepare for oral surgery. Different types of oral surgeries – surgical or wisdom teeth extraction, dental implant surgery, gum surgery, osseous surgery or sinus lift surgery – have unique dental surgery instructions. 8. Stay in best health the day before surgery. Avoid drinking alcohol or sun tanning to avoid dehydration. Stay hydrated the day before by drinking plenty of water. Contact your oral surgeon if you are sick. During the day of surgery, you have to be in best health possible. If you have a new illness, such as cold, cough, sinus infection, fever, stomach flu, fever or asthma attack, your Mexico dentist will likely postpone any major dental surgery. Before your oral surgery in Mexico, you can fill your prescriptions in one of the many pharmacies in Mexico. You are allowed to cross them through the border. Finalize transportation to and from surgery. You won’t be able to drive right after a general anesthesia procedure. Prepare detailed directions to the dental clinic in Mexico to avoid getting lost. Buy your prescription meds from a Mexican pharmacy before the surgery. Or you can have your companion buy the prescription meds during your dental surgery. Know what and where you will eat for your special diet after your oral surgery in Mexico. Avoid drinking water, juices, milk, alcohol, etc. If you have to drink water for meds, take small sips of water. Oral surgeons in Mexico work with an Anesthesiologist to deliver IV sedation or General Anesthesia. Wear loose fitting clothes, short-sleeved shirt, or blouse. Wear comfortable flat shoes (no high heels) and avoid tight belts. You get clumsy as you recover from general anesthesia. It’s one less item to worry about. Don’t forget to follow post-procedure instructions after your oral surgery in Mexico. Face makeup may hide the true skin color – an important indicator of your condition during your general anesthesia or IV sedation for oral surgery. They may also need to put tape on your face, which might not stick due to makeup. During surgery, the anesthesiologist will place a sensor on your finger to monitor your oxygen level. This sensor may not work with nail polish. Your surgeon also looks at the color of your fingernails. If your oxygen levels are low, it would turn blue. So women, absolutely no makeup and nail polish! Men, on the other hand, may have to trim or shave overgrown beards. But that’s up to the dentist on a case by case basis. Lastly, follow your post-procedure oral surgery instructions. This will include how to take care of healing gums or dental implant surgery. Oftentimes, you will get these instructions in writing from the dentist in Mexico. Questions about how to prepare for major oral surgery in Mexico? Call us at Dayo Dental (877-987-3296). What is the Cost of Full Mouth Dental Implants in Mexico?